In factory automation, where the need for high speed and precision meet, you will find the SCARA robot. SCARA is an acronym for Selective Compliant Assembly Robot Arm. This small footprint factory robot is used very effectively in applications demanding high precision, the SCARA design can reliably deliver repeatability of 0.005mm with a 0.36 second cycle time in the 3Kg payload class. If heavy payload capacity is required, heavy duty models are available up to 20Kg. 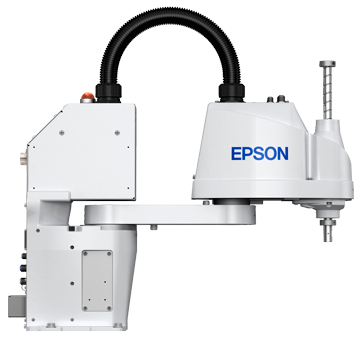 Unlike the highly recognizable 6-Axis industrial robot, the SCARA arm design is commonly limited to 4-axis, making it well suited to certain high speed tasks at a lower costs. Such tasks include pick and place, process to process transfer, work piece sorting, screw tightening, small part mounting. sealing and gluing. HTE Automation supplies SCARA robot automation systems to manufacturers throughout Kansas, Missouri, and Illinois.